Hello everyone, I wanted to share an extra post with you all, and this beautiful CottageCutz Bird with wreath. I did color the bird with copics, and the wreath i airbrushed with the copics too. I made the little flowers with seam binding, and added pearls to the centers. Here is the inside, and I used the CottageCutz Snowflake Border. Beautiful! 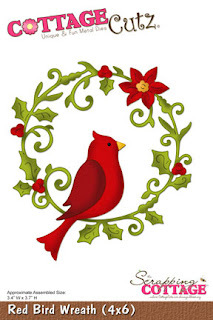 Love the circular flourish wreath and the cardinal has stolen my heart! Cheryl this is so sweet. I love your pretty stitching on this and the great layout. I need to fire up my compressor and try air brushing. Thanks for inspiring me. Lovely work Cheryl! Love all dies! This bird is just gorgeous and love it with the frame. Wow!! Absolutely gorgeous! I must have that snowflake border. Beautiful!! !